I first attempted cacio e pepe at home a few years ago. In preparation I read as much as I could about how to get the texture right. Techniques included melting the cheese in a water bath, adding starchy cooking water from the pasta, and so on. However, all of the methods I tried had the same outcome: lumpy, rubbery cheese that fell off the pasta and accumulated in the bottom of the bowl. Then, one night in a Roman restaurant, came the revelation. Here the dish was prepared in front of you at the table and so you could see exactly what was going on. And what a revelation it was. Instead of any number of complex techniques, cheese was sprinkled over the pasta in a bowl and mixed through. And that was it. The texture was perfect. I went home and immediately tried this technique which led to an instant breakthrough. Then through some more reading, speaking to some experts, and trial and error I came up with my foolproof technique which produces perfectly creamy cacio e pepe every time. I’m now going to share it with you. Cacio e pepe is often served with spaghetti or tonnarelli (square cut spaghetti), but also with short pasta. I find that short pasta works better for beginners as it holds some of the cooking water inside which helps to make the sauce creamy. Shapes such as penne rigate, tortiglioni, and rigatoni work very well. The cooking water is key to a good cacio e pepe and to get the right kind of cooking water you need to cook the pasta correctly. The rule of thumb here is 1 litre of water, plus one teaspoon of coarse salt, for every 100g of pasta. Bring the water to the boil first before adding the salt. This is because if you add the salt first, some of the water will evaporate during the boiling which could make the water over salty. This nonna approved pasta:salt:water ratio will create water with the perfect amount of starch to create a creamy sauce. 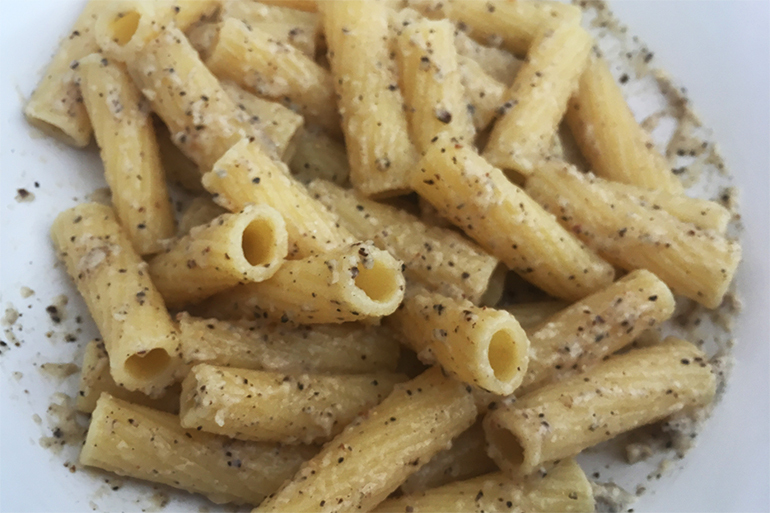 Cacio e pepe is made exclusively with pecorino romano cheese. This is a hard white cheese, recognisable by its black rind. The cheese should be as fresh as possible and grated finely. I swear by a microplane grater as this produces very thin flakes of cheese which melt perfectly contributing to the signature creamy cacio e pepe texture. At a push you can get away with a fresh Parmigiano Reggiano but it has to be really fresh. Also the taste will be different. One thing that will prevent you getting a lovely creamy sauce is not using enough cheese. Through trial and error, I’ve come up with the following ratio. For every 100g of pasta use 20g of cheese. One serving is 80g–100g of pasta. Once the cheese is grated, using a microplane grater, as I said above, you should then add 1g of freshly ground black pepper per 20g of cheese. Mix the pepper through the grated cheese to ensure an even dose. The right proportion of cheese and pepper will look like this. Once the pasta is cooked, don’t drain it. Instead, lift it out of the pasta water with a slotted spoon and place it directly into a large serving bowl. This will mean that some of the cooking water is transferred with the pasta and this will normally be enough to make the creamy sauce. You should then sprinkle the cheese evenly over the top of the pasta. Wait for about thirty seconds for it to begin to melt, and then vigorously toss the pasta together using two forks. Keep going until the cheese has melted and forms the signature cacio e pepe texture. This will take about two minutes of tossing. If the mixture seems a bit dry, add a little more pasta cooking water a tablespoon at a time. You need just enough to create the right texture. Add too much and you will ruin the dish. Bring the water to the boil in a large pan. When it is boiling add the salt and stir to dissolve. Add the pasta and cook according to the manufacturer’s instructions. Grate the cheese with a microplane grater. Add the pepper and stir through. When the pasta is cooked, remove it from the water using a slotted spoon and transfer directly to a large serving bowl. Sprinkle the cheese and pepper on top of the pasta and leave for about thirty seconds. Mix the cheese and pasta vigorously until the cheese has melted and formed a creamy sauce. Add a tablespoon or two of the pasta cooking water if the sauce is not creamy enough. Sounds scrumptious, Luca! Thank you for sharing your secret. When I lived in a flat in the Teatro di Pompeio in Rome, my neighbour, who owned a little restaurant downstairs, told me his secret for a good carbonara: mix the cheese with the egg, so it will stick to the pasta. Good Italian cooking is simple, but the secrets really matter. It’s amazing how simple these little touches are, but without them the dishes don’t work. A little local knowledge goes a long way! Buona Pasqua anche a lei!